The Hatfield train crash forced the government to overhaul its rail policy. The resulting court case could now force a re-think of corporate responsibility in the UK. The comments of an Old Bailey judge at a key moment in the trial of five rail bosses are set to put pressure on the government, which has been promising a corporate killing law since 1997. 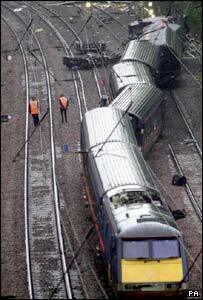 Four people died and more than 100 were injured when the London King's Cross to Leeds express train hit a cracked rail and came off the tracks on 17 October 2000. In September 2005, after an eight-month trial, Network Rail was found guilty of breaching safety guidelines. Five executives - two from the engineering firm that maintained the track, Balfour Beatty, and three from track owner Railtrack - were cleared of all charges. Balfour Beatty had already admitted health and safety breaches. Initially, the five individuals had faced manslaughter charges while Balfour Beatty was accused of corporate manslaughter. But at the midpoint of the trial, Mr Justice Mackay ordered all manslaughter charges against the individuals, and against the company, to be dropped. At the time, the judge told the jury he was not permitted to give his reasons for dropping the charges, telling them simply: "I must ask you to accept my ruling." But what had happened in court on the previous day was unprecedented. The judge had directly addressed families of the victims, and weighed into a controversial political debate. While the jurors were out of court, he said: "I appreciate that these decisions on the manslaughter counts will be a cause of concern, disappointment and perhaps distress to the relatives of those who died in this tragic crash. "I have tried to explain why it is I am obliged by the existing law in my judgment to make these rulings. "This case continues to underline the pressing need for the long-delayed reform of the law in this area of unlawful killing." Balfour Beatty was charged with manslaughter under the Health and Safety at Work Act, 1974. Under the Act, a company can only be convicted of corporate manslaughter if a senior individual in that company is guilty of "gross negligence manslaughter". In the Hatfield case, as Judge Mackay put it, the conduct of the individuals was "at its highest, a bad error of judgement" and nowhere near gross negligence. Therefore, the case against the individuals had to be dropped. With no individuals accused of manslaughter, the company could not be guilty of manslaughter. Campaigners for a change to the law believe there should be a corporate killing law entirely separate from the laws covering individuals. Bob Crow, boss of the RMT union which represents many rail workers, is among those calling for a change. "Without a doubt" Network Rail/Railtrack, which was in overall control of the rail infrastructure, and Balfour Beatty should have faced criminal charges, he said. "If the companies do well, they get massive rewards, so if something goes wrong, they should be held responsible," he said. Several other trade unions, relatives of victims and the Institute of Directors have all given their support for such a law. The Labour Party has promised a corporate killing law in each of its last three election manifestoes. In March, the government published a draft bill for consultation. But there is still no law. A Home Office spokeswoman said: "It is a very complicated area of the law and we have consulted widely with both industry and the legal profession to make sure we get it right. "The consultation is now closed and we are looking for parliamentary time to introduce the legislation." The fallout from the Hatfield case may just help to find a gap in the parliamentary diary.